President Armen Sarkissian has expressed his full support to lead the talks on the Nagorno-Karabakh conflict to a successful end. 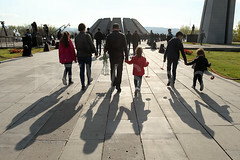 On 12 April, Armenia’s president also told journalists that the successful end is the exercise of the right of Artsakh to self-determination. “Of course, the sole purpose of the talks on the Nagorno-Karabakh conflict in the past and today is eventually a peaceful resolution. 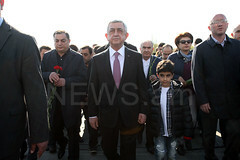 Of course, I’m not participating in the negotiations as President of Armenia. The negotiations are being led by the Minister of Foreign Affairs and President of Azerbaijan and the Prime Minister and the Minister of Foreign Affairs of Armenia. You can be rest assured that I will provide my full support to lead the talks to a successful end, meaning the end when we will see an ultimate solution to the issue of Karabakh’s self-determination and an ultimate resolution of the Nagorno-Karabakh conflict, and through peace at that,” Armen Sarkissian said.